We want you all to have a Holly Jolly Christmas this season, so pardon if we seem like kill joys but the stats don’t lie! According to the U.S Consumer Product Safety Commission, over 14,700 of you have to leave the company of your loved ones to rush to the emergency room due to holiday-related accidental injuries. We have compiled a list of common holiday hazards so you can be familiar with the warnings signs to better protect you, your loved ones and pets! Trees that are caught on fire or have fallen are huge concerns during the holidays. Most Christmas tree fires (40%) are caused by lighting equipment, followed by decorative lights and involved wiring. Also, if your tree isn’t properly secured, it could be knocked or pulled over easily. This can do damage to family members, pets, furniture, and valuables. In the case of a fallen tree, you’ll want to ensure you are fully protected with homeowners’ liability coverage. Only use artificial trees that are fire retardant by the manufacturer. Choose a fresh, green tree. The needles should not fall off when you touch them. If they fall easily, the tree is dry and more likely to cause a fire. Turn off Christmas Lights when you leave the house, go to bed, and a few hours each day. If you leave lights on 24/7, they can overheat and cause a fire. Don’t use lights that have a broken cord or loose bulbs. Choose lights that are labeled “fire safe”. Position tree away from heat sources like fireplaces, radiators, candles, and heat vents. 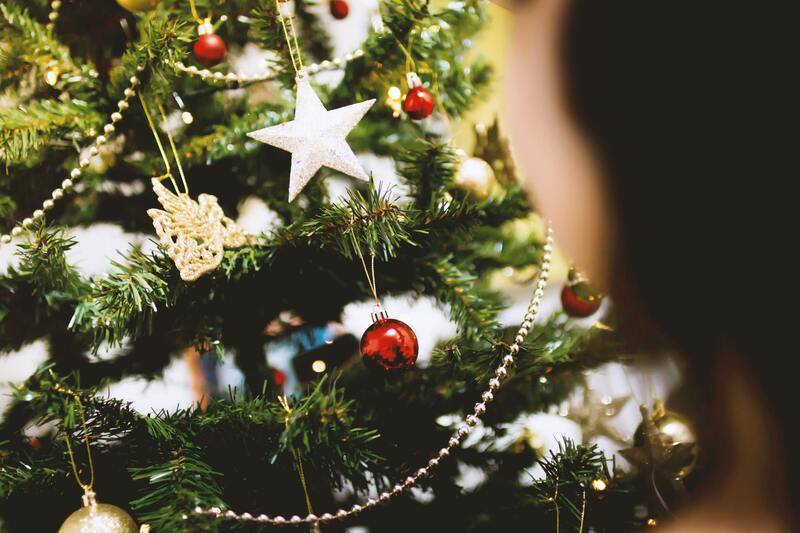 Consider using a humidifier near the tree to keep the air around it moist. Keep the tree hydrated. A 6-foot tree needs 1 gallon of water every two days. Never mount a dry tree. Always mount in a container of water. Buy tree cradles/stands that screw into the base of the tree. Don’t place trees near windows, expensive furniture, or children’s play areas. Always put up the tree with at least two people to avoid injury. Before decorating, let the tree sit overnight to help it settle into shape. Pick up needles on a daily basis to prevent pets and infants from ingesting them. Decorations on the tree and house can do some serious damage. This is not only a loss of financial and emotional value, but it can also create a hazard for pets, children and barefoot passers-by who could step on the glass shards. Avoid using small decorations and ornaments if you have kids in the house. Avoid decorations with sharp edges. Inspect chords to ensure they are not frayed or bitten. Don’t put lights on the tree where pets or kids have access. Always have someone helping you when putting lights around the house. Make sure ladder is leveled to avoid a nasty fall. Let’s face it, it’s hard to resist the puppy eyes our dogs give us when they want a taste of our food. But, its important for us and our guests to know what we can and can’t offer our fur babies. Food safety isn’t just for our pets though, it can also be a huge issue for humans as well if food is not cooked or stored properly! Do not give your pets chicken and turkey bones for risk of choking. Avoid giving THESE foods to your pets during the holidays as it can cause severe vomiting, diarrhea, seizures, and even death. Store food properly and at the correct temperature. Keep your meat, poultry, and eggs separate. Transporting your tree from the lot to your home can cause serious accidents on the road if you don’t take proper precautions. Consider talking to your agent about your Auto Insurance before hitting the road hauling your green-pined beauty! Place a blanket on top of your car or truck before tying down the tree to prevent scratches or dents. Tie the tree in tarp netting to prevent loose branches from falling off. Face the tree with the base of the tree towards the front of the car and the top of the tree towards the back. Secure the tree firmly to the car. Avoid potholes and watch for low clearance. Have a fun and joyous holiday this season taking the right precautions to better protect yourself and family with these tips and tricks!